Designed to fit the Animal Instincts Comfort Dog Crates. Made from a strong polyester these covers are lightweight, compact and machine washable.With zips at each corner for ease of fitting and pockets for storage of toys and other essentials. The cover keeps your pet calm and reduce anxiety whilst travelling or when near other animals. 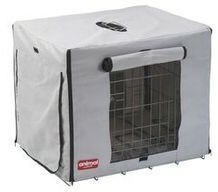 Front and side doors that can be rolled open as required to reassure your pet and yourself. Mesh insect screen to keep the bugs away.